W/ an acrylic based leather finish and neutral polish/wax, you could have what you are wanting. yeah, i opted for self-service and bought all the necessary tools. in the end, I do not want anybody doing a cheap job on my "belt" besides me. the picture is a composition after done work. Quality is amazing, def the nicest belt i've ever owned. Fit is perfect as well, I'm a happy man. I'll post a fit pic in a few. ^how much are these belts btw?...looks awesome. how long did it take you to get your belt? I've been waiting for 3 weeks and still no ETA. from what I hear they've been really busy lately. Here is my LGC, next week I'm getting a tanner . Sorry for the crappy blackberry pictures. anyone have any experience with the "traditional" line from tanner? i just picked up the traditional bronze in natural leather. pics when i get it but... from the looks of it that'll be in a while. Yea it took about 3 weeks for mine to arrive..they didn't send a shipment notification or anything so you'll probably get it any day now. Well worth the wait. I actually just went down to Hecklewood where the Tanner Goods workshop is to pick up my belt. They have started remodeling, or revamping (whatever), the store and all that. So, that may be one of the reasons they're a little delayed. Anyways, I went into Hecklewood on Friday last week to check out belts and get some help with sizing too. I ended up ordering this nice london tan, a bit lighter than the original london tan color, with black hardware, and i picked up a natural colored cardholder. They had it all made and ready for pickup by tuesday. I'm really happy with the sizing, quality and color, the guys there are awesome and super friendly. I'd definitely recommend them to anyone in the market for a new high quality belt. This picture demonstrates the color of the belt the best. Pretty cool combination with the black/tan, is that your weed stash and a scale in the background? Anyways, I also noticed the difference in color with the London Tan on my Tanner belt, of coarse it won't really matter in the long run since the color will change over time. I honestly like the toned down color a lot better, as the color of their previous run was a little too rich for my taste. It kind of worked out since I was torn between buying a Natural and a London Tan. Mine is more like in between, very comparable to a manila envelope. Yeah, that belt looks nice Turbo. I got the color for the same reason. Looks good. EDIT: No, that isn't my stash. hahahahaha, that's my roomies. his desk is right next to the window, so i went over there for natural light pictures. My Tanner skinny natural belt finally arrived yesterday. Definitely a high quality piece, makes me want to get another of a diff color too. Ive got a size 36 (to the middle hole) unlucky made belt for sale if anyone wants. worn less than 10 times, Im allergic to the nickel belt buckle. Just copped a Levi's belt buckle like this one. Found it at the world's shittiest thrift store. I was about to bolt after finding nothing but crap (like a thousand tattered Fubu sweatshirts from the 90s), and there it was. Made by Bergamot Brass Works in the 70s. Mine for the exorbitant price of $0.99. 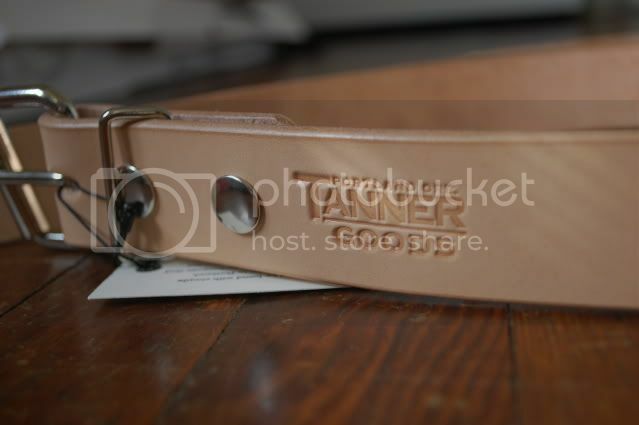 Anyone know where to buy the black powder coated roller buckle and keeper on the tanner belts? ^ why dont you just purchase it off their site? anyways i recently purchased a tanner belt from a local store (since i decided to support my local). just curious because my belt does not have the "portland OR, tanner goods" stamp on it. all it has is the little "TG" logo and the "tanner" stamp on the reverse side. Yeah, the Portland one is their newer design... Gotta rep your locals. new e-ccomerce launching in a few weeks... hold tight kiddos. Lots of stuff in the pipeline..
dang, just ordered a belt from you guys on sat. Guess I'll be back in the market for some new leather goods come 2015 when I finally break the one coming right, ha. definitely, take care of them and theyll take care of you!